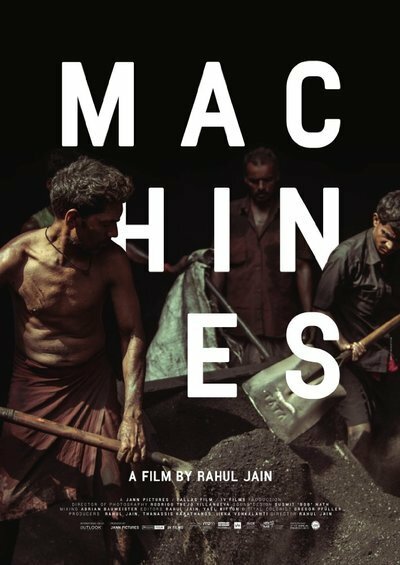 Rahul Jain’s “Machines,” a documentary about a textile factory in southern India where workers endure Dickensian conditions of 12-hour days for minimal pay, is a film so obedient to current academic fashions in both politics and cinema aesthetics that it ends up feeling both contrived and a bit dishonest. The aesthetic part of its contrivance is evident immediately. Jain’s camera takes us inside the operating factory and moves about it observing the workers going about their tasks in traditional cinema verité fashion. The lighting is apparently all natural, which gives the environment—with its dim browns, grays and greens occasionally offset by the brighter hues of manufactured fabrics—a kind of macabre cast that in some moments can be strangely beautiful. The men who labor here, ranging from teens to middle-aged, do their work of running machines and hauling various materials with the dull regularity of automatons. For a while, no information is given regarding the people we’re watching or the place. Then, one worker speaks to the camera. Later others will. (The filmmaker interviewing them is never seen nor heard.) The men talk about their hard lives and the conditions they work under. They work 12-hour shifts and are given no comforts. They must buy their own food and water. Many, it seems, are poor farmers who have to travel long distances for the factory work. One speaks of riding a train for 36 hours, unable to sit down and with only crushed chickpeas to eat. “The $40 billion Indian textile and garment industry, much of which operates in the informal sector and is poorly regulated, employs an estimated 45 million workers. More than 12 million children are engaged in child labor in India and 95% of the factories have no trade unions on their premises. “Overtime practice reaches about 70 to 80 working hours a week and is mostly not paid—or underpaid. With an average daily wage from $2 to $5, the workers take home between $90 and $150 per month. Such information is of course highly relevant to the world shown in “Machines." However, viewers who want to understand that world would be better off seeking out pertinent magazine articles or books, texts where fashion doesn't suppressed information or avoid it in the name of stylistic puritanism. As its interviews continue, the film hears from people whose comments do touch on some issues that viewers are likely to wonder about. Unions, which might help replace 12-hour stints with an eight-hour day (a goal that most workers seem to fervently desire) are regularly thwarted by the owners, we’re told. Any time a union movement gains steam, its leaders are eventually identified and killed. Later in the documentary, we see some of the people who buy and sell the fabrics the workers manufacture. With their sharp haircuts, nice clothes, aviator sunglasses and smartphones, they are a different order of being than those we’ve been observing, and they seem unthinkingly comfortable as they go about their business. We also hear from one factory manager who’s the very picture of smug self-righteousness. He says he now pays his workers ten times what he did when he started out 12 years before, but he evidently finds them irresponsible and ungrateful. Only half of them, he says without offering proof, send money to their families. The rest fritter it away on tobacco and alcohol. Another thing the press kit reveals that’s not in the movie: Filmmaker Rahul Jain grew up visiting a factory like this that was owned by his grandfather. When he went back to film, he knew some of the workers, and was given full access due to his connections. The very best scene here—one that suggests the premise of a much better movie—comes very late, when there’s a crowd of workers facing the camera and, in effect, demanding to know what he’s going to do with the access he’s had. Is he going to do anything to help them? If Jain had spoken to them, and incorporated his own memories and feelings about the subject into the doc rather than hiding behind the privilege of the auteur, “Machines” would be a much richer and more revealing film. But he keeps silent, leaving them to suspect that he’ll do no more good for them than the politicians who come through, offer empty promises, then retreat back into their privileged lives.